1Jawaharlal Nehru Medical College, Aligarh, Uttar Pradesh India. 2Department of Radiodiagnosis, Jawaharlal Nehru Medical College, Aligarh Muslim University, Aligarh, Uttar Pradesh, India. 3Department of General Surgery, Jawaharlal Nehru Medical College, Aligarh Muslim University, Aligarh, Uttar Pradesh, India. *Address correspondence and reprints request to: Abhishek Jha, Jawaharlal Nehru Medical College, Aligarh, Uttar Pradesh India. 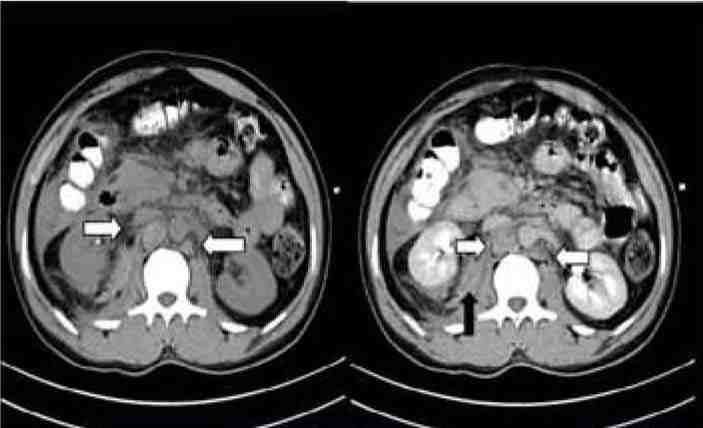 Jha A, Ahmad I, Gupta P, Gupta G, Ahmad M, Saud M. Isolated Crural Hematoma Mimicking Retroperitoneal Lymphadenopathy, A Unique Sign of Traumatic Diaphragmatic Rupture: A Case Report. Oman Med J 2014 Sep; 29(5):373-375. Diaphragmatic injury following blunt thoracoabdominal trauma is rare and is usually associated with key radiological features like dependent viscera sign, collar sign, diaphragmatic thickening and defects. It may also be associated with secondary signs like intrathoracic herniation of abdominal viscera. Diaphragmatic crura, which are attached to the upper lumbar vertebra represent prominently thickened folds along the posterior diaphragm, are usually inconspicuous on routine Computed Tomography (CT) scans. We present a case of a young patient who sustained a motor vehicle accident and developed difficulty in breathing. CT scan of the patient revealed bilateral crural hematomas, with splenic and renal lacerations and no other sign of diaphragmatic injury. The patient was operated and blunt diaphragmatic rupture was confirmed at surgery. Keywords: Diaphragm; Thorax; CT scan. Blunt diaphragmatic ruptures are difficult to diagnose at initial presentation because of non-specific clinical features. Moreover, the radiological findings are usually unsupportive. However, these injuries do not resolve spontaneously; therefore, it warrants timely management. Consequently, a high degree of suspicion should be kept in all cases with thoracoabdominal injuries. They are usually seen in association with other injuries and solitary diaphragmatic injury has never been reported. Few radiological signs have been mentioned in literature but crural hematomas mimicking enlarged lymph nodes have never been described. This case report highlights the importance of this unique radiological sign in early diagnosis of diaphragmatic rupture. A 24-year-old man was brought to the emergency department after sustaining blunt thoracoabdominal trauma after a motor vehicle injury. On examination, vitals of the patient were stable with mild tachycardia. General examination of the patient was unremarkable and respiratory examination of the patient revealed reduced right sided air entry and fine crepitations were heard along the right lung base. Preliminary routine investigations were normal and the patient's chest x-ray (postero-anterior view in erect position) revealed blunt right costophrenic angle with elevated right hemidiaphragm. The x-ray showed no evidence of rib fractures or pneumothorax. Being hemodynamically stable, the patient was put on conservative management. However, 7 hours after admission, the patient developed severe chest pain that was not relieved by NSAID’s. He did not develop any tachypnea and his oxygen saturation remained normal. A CT scan of thorax and abdomen was done to elucidate the cause of chest pain. It revealed bilateral hemothoraces and crural hematomas, where the enlarged crura were extending inferiorly in close relation to the abdominal aorta bilaterally simulating retroperitoneal lymphadenopathy. On non-contrast CT (NCCT) images, these lesions reflected diffuse hyperdensity. Additionally, renal and splenic lacerations were encountered with perinephric hematoma and moderate hemoperitoneum. Figure 1: Chest Radiograph Posteroanterior view of the patient, showing blunt right costophrenic angle with elevated right hemidiaphragm. The patient was taken for laparotomy, where blunt tear of right hemidiaphragm was confirmed with no evidence of adhesions or herniation of the bowel loops. No bowel injury was noted and the spleen and the kidney were left untouched. The defect was sutured and the patient had an uneventful post-operative course, and subsequently the patient was discharged. Follow up X-ray of the patient two days after surgery revealed no detectable abnormality. Figure 2: Non contrast and post contrast CT scan of the patient showing well defined nodular lesions in para-aortic location, with hyperdensity on non-contrast images representing crural hematoma (White arrows), also evident is right perinephric hematoma (Black arrows). 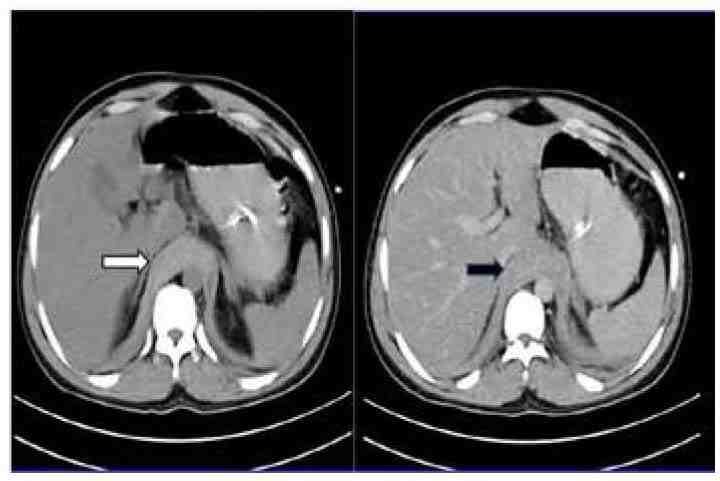 Figure 3: Axial non-contrast and post contrast CT scan of the patient shows thickened diaphragmatic crura, which appear hyperdense on NCCT images (White arrow) representing crural hematoma. Diaphragm is a musculofibrous septum that separates thorax from abdominal cavity. The overall incidence of diaphragmatic injuries in patients sustaining blunt trauma ranges between 1-8%,1 out of which 90% of cases are secondary to motor vehicle accidents.2,3 There is an overall left sided predilection, which is affected almost 3 times more than right side.3,4 The possible proposed explanation for left sided preponderance is provided by the buffering effect of liver on right side and an area of potential weakness along the posterolateral aspect on left side. The optimal treatment of these injuries is early surgical repair,9 as they never heal on their own. Further, the thoracoabdominal pressure gradient during respiration may enlarge the defect and can lead to complications such as bowel strangulation and formation of adhesions. Isolated crural hematomas extending inferiorly in the para-aortic location bilaterally, simulating retroperitoneal lymphadenopathy has never been described in patients with diaphragmatic ruptures. Key features in distinguishing them from retroperitoneal lymphadenopathy were hyperdensity on non-contrast images and no perceptible enhancement on contrast administration. Retroperitoneal nodes enlarge as a result of malignant or inflammatory processes. . On CT, they appear as discrete, spherical structures with variable contrast enhancement. The purpose of this case report is to highlight the importance of crural hematomas in diagnosing diaphragmatic injuries, as delay in diagnosis can lead to life threatening complications. Diaphragmatic injuries though uncommonly encountered in clinical practice, can be fatal if not treated promptly. Imaging studies are pivotal in making an accurate and timely diagnosis. Numerous radiological signs of diaphragmatic rupture have been mentioned in literature, but crural hematomas have seldom been described. Crural hematomas are non-enhancing spherical structures and may be confused with retroperitoneal lymphadenopathy. A comprehensive knowledge of imaging features coupled with keen observation is required for differentiating between the two entities and making a prompt diagnosis. 1. Chughtai T, Ali S, Sharkey P, Lins M, Rizoli S. Update on managing diaphragmatic rupture in blunt trauma: a review of 208 consecutive cases. Can J Surg 2009 Jun;52(3):177-181. 3. Shanmuganathan K, Killeen K, Mirvis SE, White CS. Imaging of diaphragmatic injuries. J Thorac Imaging 2000 Apr;15(2):104-111. 4. Nchimi A, Szapiro D, Ghaye B, Willems V, Khamis J, Haquet L, et al. Helical CT of blunt diaphragmatic rupture. AJR Am J Roentgenol 2005 Jan;184(1):24-30. 5. Atoini F, Traibi A, Elkaoui H, Elouieriachi F, Elhammoumi M, Sair K, et al. Missed right post-traumatic diaphragmatic injuries: a review of six cases. Rev Pneumol Clin 2012 Jun;68(3):185-193. 6. Rodriguez-Morales G, Rodriguez A, Shatney CH. Acute rupture of the diaphragm in blunt trauma: analysis of 60 patients. J Trauma 1986 May;26(5):438-444. 7. 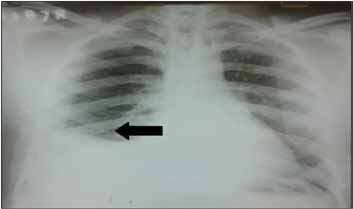 Gelman R, Mirvis SE, Gens D. Diaphragmatic rupture due to blunt trauma: sensitivity of plain chest radiographs. AJR Am J Roentgenol 1991 Jan;156(1):51-57. 8. Killeen KL, Mirvis SE, Shanmuganathan K. Helical CT of diaphragmatic rupture caused by blunt trauma. AJR Am J Roentgenol 1999 Dec;173(6):1611-1616. 9. Larici AR, Gotway MB, Litt HI, Reddy GP, Webb WR, Gotway CA, et al. Helical CT with sagittal and coronal reconstructions: accuracy for detection of diaphragmatic injury. AJR Am J Roentgenol 2002 Aug;179(2):451-457.